← Are You a Veil Gal? It’s so interesting how we develop traditions that carry on and on throughout the years. I like to think the “Something” tradition means a little something different to everyone. I did, of course, being the curious person I am, look up the origins of the “Something” tradition. The Something Old symbolizes your past and the generations that came before you. On the day of your wedding it’s nice to think of the women generations ago feeling the same way you did on the day of their wedding. It can be represented by an old heirloom or picture of a cherished ancestor, or really anything that represents your family. The Something New symbolizes the new life you are about to embark on. This can be TONS of different things. Many women use their engagement ring, or their wedding jewelry to represent the Something New. 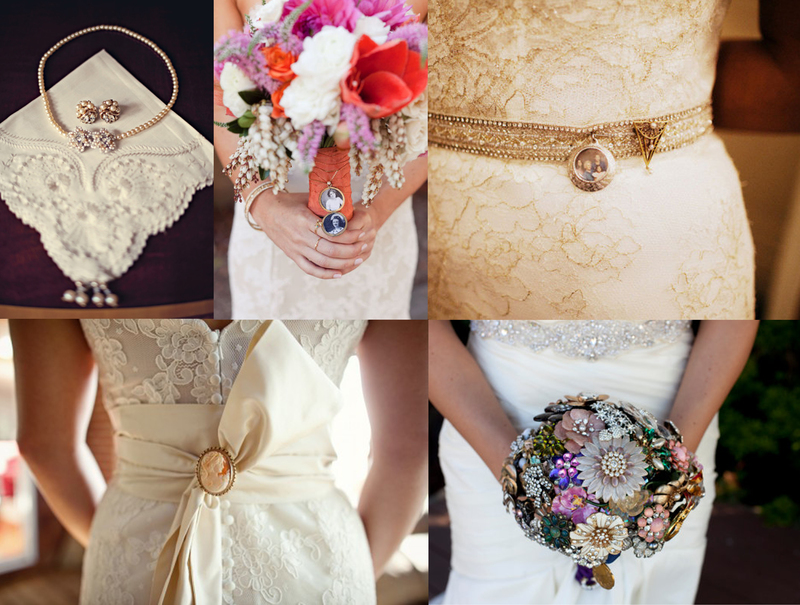 It’s very apropos to use wedding jewelry because it really does represent the new life you are starting. The Something Borrowed is very interesting and seems to have a few different meanings. It can stand for borrowed happiness, those around you adding to your happiness for the day. It can also stand for (and I like this one best), how your friends and family are always there to help you out in a pinch, and as we ladies all know, borrowing accessories is what girls often do! So it is common for your Something Borrowed to be an accessory from a good friend or family member. 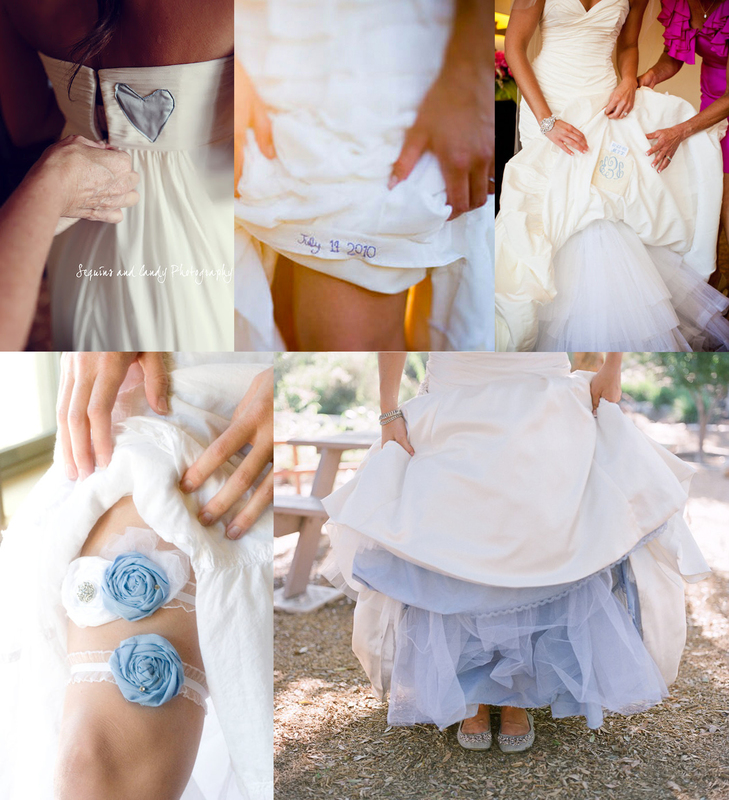 Something Blue means a BUNCH of different things, love, fidelity, loyalty, modesty, and purity. You can choose whatever meaning you want for it and of course choose whatever way you want to display it! Jewelry is always popular, but many brides mix it up with blue shoes, or blue accents to their dress. Ah yes, the last bit, the Sixpence in Your Shoe, it simply means wealth and prosperity. As the tradition goes, you should put a silver sixpence in your left shoe for the best wealth and prosperity. Lots of people use pennies now a days…don’t ask me how a penny is expected to bring you wealth, it would seem that a hundred-dollar bill would put you off to a better start, but not as easy to insert into a shoe. If you really want to keep to tradition you can order a sixpence online to put in your shoe, then you can display it later. After all, I’m pretty sure sixpence aren’t being minted as currency anymore, in your old age it might ACTUALLY make you wealthy to have a genuine silver sixpence! I still have no idea what I am going to do for every single one of those things. And 10 to 1 I won’t even be wearing shoes so the Sixpence thing is out because I’m not glueing a coin to my foot! What are your “Somethings”? I need ideas!